We all know what we want from our customer loyalty programs; more, and more profitable, customers. The trouble is that customers are notoriously fickle, changeable, arbitrary, and our lifeblood. What worked last month may not work today. So Loyalty Programs need regular check-ups to make sure they are still achieving their objectives – in just the same way you need to regularly check and service your high performance automobile. In fact, I sometimes think all Marketing professionals should drive old exotic sports cars, to get a feel for how much tinkering is required to keep relationship marketing initiatives on the road! 1. Is it still mechanically sound? Brakes, steering, fluid levels all OK? Make sure ‘BAU’ does mean ‘Business as Usual’, not ‘Best Are Upset’. 2. Is the ignition system still tuned correctly? Poorly tuned programs can cost you money by rewarding the ‘wrong’ behaviours. This comes about as prices creep, or sometimes just because the program has succeeded in distilling membership to your loyal and committed customers. When this happens, tier thresholds stop becoming aspirational and start rewarding customer’s regular behaviour. Worse still, tier advancement and privileges become an entitlement in the eyes of the member, not a thank you for a stretch. You end up paying more for business you stood a good chance of getting anyway. Even if your program does not have membership tiers, reward thresholds are subject to the same ‘bracket creep’, and should be reviewed regularly. Thank Mr Pareto and plot your members into a curve by their value and the percentage of your business they represent. Make explicit decisions about what percentage of your customers you want to reward and by how much. Then recalibrate tier thresholds and reward point values. Build in planned value ‘stretches’ where customer types change to encourage members on the ‘cusp’ to spend a little more to achieve the next level/reward. This is the loyalty program equivalent of the ignition timing light in that exotic sports car. 3. What is your fuel economy? 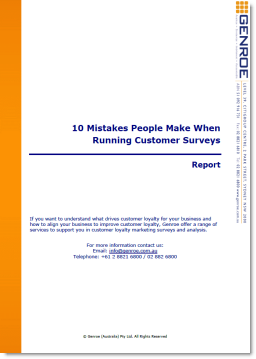 It is not always easy to measure the mileage you are getting from your customer loyalty program. Proving which action caused customers to stay and spend is difficult. But you do need a fuel flow meter on your program or inevitably the accounting types will question why you don’t take the bus instead. For Loyalty Programs the flow meter is generally the measure of customer churn and the potential value that a customer who leaves takes with them. Customer Lifetime value measures that look at member retention, segment population and average member value allow us to take a snapshot of the current value of current & future customer cash flow (in today’s dollars), just like a Balance Sheet takes a snapshot of the companies physical assets. These snapshots, compared over time show the impact your relationship marketing investment is having on member value. For a more direct measure, or if customer churn is not an issue for you, calculate the sales lift that is required to pay for the program operation and relate this figure to the relative spending of customers who have redeemed in your program versus those who have not in the last X months (determined by your customers shopping frequency). If the difference covers the sales lift required, you have evidence the program is paying its way. 4. Does the car still look good? Paint and body work perfect? The more a member has to do to earn rewards in your program, i.e. the more valuable the customer, the more important it is that the rewards include status, recognition, and exclusivity. Would your Platinum members be proud to pull your membership card from their wallet? Is your program an MG or a Ferrari? Which image would your target customers prefer; driving cap or helmet? What others are saying about the program and its image is growing in importance, so a social media strategy is now a critical factor in Loyalty Program success for the members most interested in membership as a badge. 5. And finally, the most important question; is it still fun to drive? Are customers actively accumulating and spending your currency, joining in your facebook discussions, redeeming a mix of your rewards (versus cash back)? If these measures are falling, perhaps it’s time to think about that super charger or more comfortable suspension?